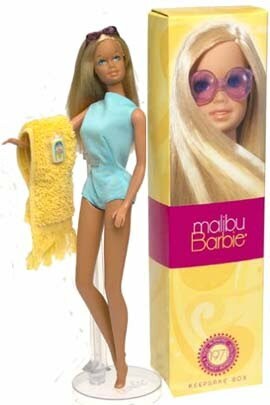 I think Malibu Barbie was the toy that started my fascination with California. It was later encouraged by TV shows, especially "CHiPs," but man, other Barbies had jobs -- they were Rockettes, or vets, or teachers. Malibu Barbie just lay around in the sun, with her sky-blue swimsuit and her Jackie O sunglasses. Malibu Barbie was and is my favorite Barbie of all time. What's yours? My first was Ballerina Barbie. But my favorite was my circa 1978 Malibu Barbie. She had a blue bikini and tan lines! I loved her straight hair. It didn't get frizzy like the wavy haired Barbies. I lived in Northern Califirnua which is more like Oregon than LA, so I thought she was so cool. My favorite was suntan Tuesday Taylor. Not a Barbie, I know, but when my sister asked for Malibu barbie and I asked for Tuesday Taylor guess which one of us felt like we got the short end of the stick on Christmas morn... Yep, my sister!